New research by Kate Marshall from the University of Cambridge’s Department of Zoology and Dr Martin Stevens from the University of Exeter’s Centre for Ecology and Conservation, published today in Scientific Reports, shows that individual lizards are able to choose their resting spot wisely and select a rock in their natural environment that will make their backs less conspicuous to avian predators. “One intriguing puzzle remains: how do the lizards ‘know’ how camouflaged their own backs are to a bird against a particular rock?” She adds. Other types of lizard, such as chameleons and geckos, are able to rapidly change colour in a matter of seconds or minutes to better match their background environment and avoid being spotted by approaching predators. 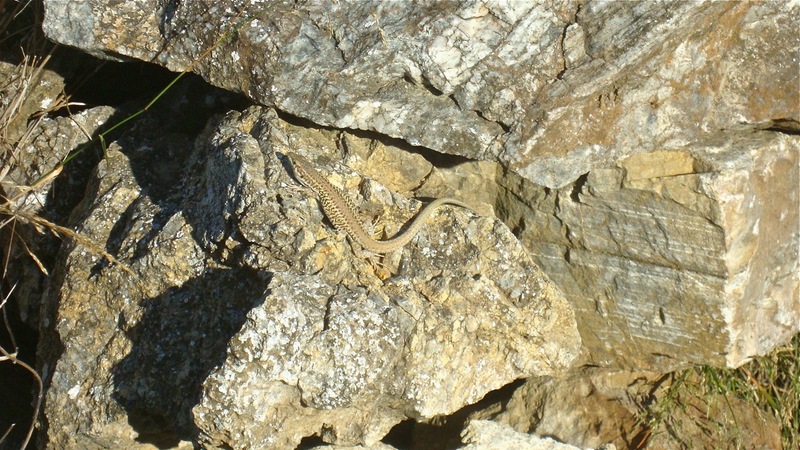 Aegean wall lizards, which are widespread across the South Balkans and many Greek islands, are unable to do this. Instead, this new research shows that they enhance their level of camouflage to hunting birds by choosing to rest on rocks that are more similar in colour to that of their own backs. Birds see the world differently from you or I: for example, they are able to see ultraviolet light whereas we cannot, which means they perceive color (and camouflage) in a very different way. Marshall and her colleagues used visual modelling to test how conspicuous individual lizards would be to a bird’s eye against the backgrounds they had chosen to sit on. Marshall and her field assistant and co-author, Kate Philpot, found that on each island individuals showed better colour matching against their own chosen rock backgrounds than against other lizards’ rock backgrounds, as perceived by avian predators such as the crows and raptors abundant in their study sites. The researchers also found that lizards’ resting site choices that heightened individual camouflage were more evident on islands with higher numbers of predatory bird species, suggesting that this behavioural defence is more likely to evolve in riskier environments. It was also more apparent in female lizards, probably because males have a conflicting need to stand out against the rocks to attract mates. “As for the puzzle over how the lizards ‘know’ how camouflaged their own backs are against a particular rock — one theory is that it is under genetic control, while another possibility is that it develops in early life through learning from other lizards and from experience,” says Marshall. “Although we don’t know what the exact mechanism is yet, we hope to uncover some clues in future research. It would also be interesting to look at whether lizards can adjust their choice of rock not just for camouflage but also to aid thermoregulation (basking site choices) and sexual signalling,” she adds. “Our study shows that there is much more to camouflage than just an animal’s appearance — how individuals behave and what backgrounds they choose to sit on can have a major bearing on how effective their camouflage will be. This is something that needs much more research in future,” says Stevens. This research shows that individual animals’ behaviours can increase their chances of survival by allowing flexible, real-time adjustments to the many different microhabitats encountered in the wild. Marshall suggests that it also emphasizes the importance of considering broader environmental contexts, such as predation risk, as well as the perceptual abilities of natural observers like predators in studies of animal behaviour. The above post is reprinted from materials provided by University of Cambridge.